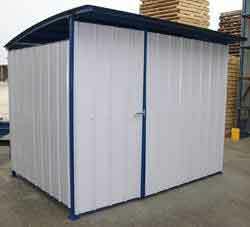 The modular storage building is one of the most versatile structures in existence. So many and broad are its applications that it is used in both commercial and residential environments. Industries, hospitals, and schools use these buildings to store items that would otherwise consume too much interior space within their buildings. <?xml:namespace prefix = o ns = "urn:schemas-microsoft-com:office:office" /> Homeowners love these buildings even more. They are ideal places for storing lawn tools, home maintenance equipment, and power tools. Many residents who purchase them also use them as personal workshops. The Easy Rack Storage Building has an interior that measures 45 feet wide by 74 feet high. Inside as well, there is floor that stands 5 and three quarter inches above the ground. This floor keeps products dry. Interior air space is also kept dry by built in rain gutters for water drainage. This keeps water from accumulating on the roof and leaking in. One of the key advantages this modular building offers is portability. It can be moved completely intact as is, with a forklift. There are many benefits that modular storage buildings offer. First off, they are far less expensive than buildings which require traditional construction materials and techniques. Secondly, having one of these buildings onsite helps an organization save space. Considering that anything stored consumes area within the vertical cube, it becomes readily apparent how valuable this can be to a warehouse, public school, or commercial office complex with limited interior area. Modular buildings are so popular now that many manufacturers will custom build them to specific dimensions. This has made them prolific in virtually every vertical market. 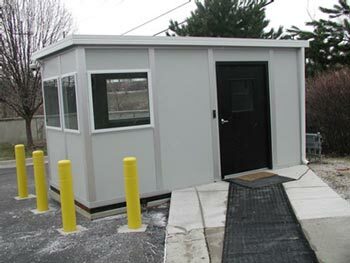 Finally, the portability of a modular building is another great benefit to any company that cannot afford to lose time. When all that is required to move a building is a few short minutes on a forklift, process flow can be maintained and production remain on schedule. Modular buildings are not just used in factories and warehouses. They are often used by schools. Schools must keep a large number of supplies on hand. These things include desks, paper, tables, and books. Also, cleaning supplies have to be kept in bulk to keep the school in good working order. One or more modular buildings are ideal places to store these materials in order to conserve limited space within smaller school buildings. Churches also frequently use storage buildings. Today’s churches do much more than hold traditional services. It is now common to see even the smaller churches hosting outdoor festivals, concerts, putting on plays, and holding outdoor events. Chairs and tables are needed for these events. Other special materials may be needed as well, depending on the activity. A modular building gives the church a place to store all of these items without having to store them in the main sanctuary. Healthcare establishments are also using modular buildings now to store a wide range of supplies. Anything vital to hospital maintenance that is not tied directly to in room patient care can be stored safely in these buildings without risk of contamination, and without risk of damage to materials. 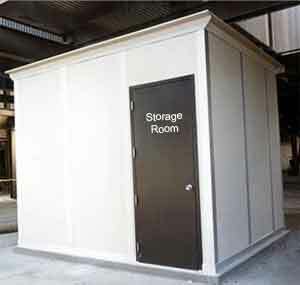 Office buildings also use storage buildings to store equipment for maintaining exterior grounds. Fertilizer, maintenance supplies, and landscaping tools can be kept out of the elements and neatly arranged in one of these buildings.